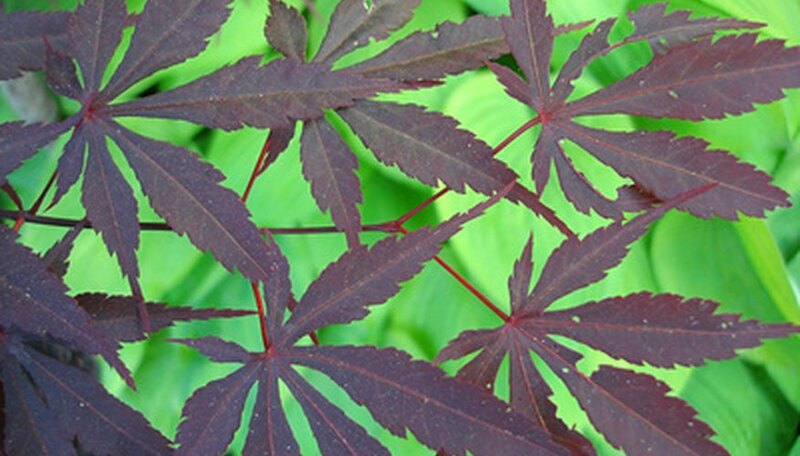 Red Japanese maple leaves achieve their best color in full sun. Ample summer water is also key to healthy, vibrant foliage. In regions that are in USDA Hardiness Zone 8 or below, the fall chill brings out their intense red color even more. A true dwarf Japanese maple is one that is 6 feet tall or less at maturity. Because many have weeping growth habits, they may appear to be even smaller. This dwarf Japanese maple (Acer palmatum Shaina) is one of the most heat tolerant of the red varieties. It is part of a larger variety, Bloodgood, which sometimes raises confusion between their identities. When planted in full sun, it holds its red color all summer. In warmer regions the leaves may turn bronze-red. The color intensity increases in the fall. The leaves are arranged in tight clusters, giving this shrub a full appearance. The mature size is 4-to-6 feet tall and equally as wide. Shaina is hardy to Zones 5 to 6. Though Orangeola (Acer palmatum Orangeola) is labeled a red dwarf, it is actually a bit of a chameleon. It starts in spring with red-green foliage, then turns deep purple-red during the summer. After that, new green leaves appear and turn purple again. So, during certain periods, it has a mottled coloration. It was aptly named for its vibrant orange-red fall leaf color. A full sun position only intensifies this shrub's hues. It is extra small in stature, maturing to 3-to-5 feet tall and wide. It is a fast grower but weeping, so it will grow in width faster than height. Orangeola is hardy to Zone 5. This variety, (Acer palmatum Bene hime), averages 3 feet tall, but can reach 5-to-6 feet over time. It stands out among other dwarf varieties because of its tight appearance. The leaves are small and arranged in tight clusters. For this reason, Bene hime can easily be crafted into bonsai. It is also a good specimen shrub for a large container. Even though it is one of the smaller dwarfs, it reaches its full size quickly. It is predominately red, but in the summer the foliage may display a hint of green. This maple is hardy to Zone 5. This variety, (Acer palmatum Pixie), is an example of a heat-resistant dwarf Japanese maple. The individual leaf lobes are wider than other types for better heat resistance. The deeper red-purple pigment also protects the leaves from burning. In the fall, Pixie is a vibrant red. These maples have a full appearance because each leaf has seven serrated lobes. An added bonus is the black bark color, which only makes the foliage stand out more. Pixie will reach 4-to-6 feet tall over time and is hardy to Zone 6. Red Dragon (Acer palmatum Red Dragon) is a 3-to-5 foot dwarf with an upright habit. The advantage to growing this shrub is its reliable red summer color. In warmer regions it could become bronze-red in late summer. In cooler climates it develops intense red color during the same period. Because it has dissected leaves, it must be kept well hydrated during hot periods. Red Dragon is hardy to Zone 5. Why Are Maple Leaves Red All Year Round? What Is the Meaning of a Red Carnation?